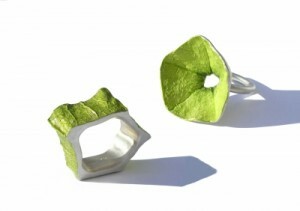 The Physalis-jewellery is not only inspired by nature but also the mantle of the Chinese lantern fruit (physalis alkekengi) is the basic material for this jewellery by Christine Brodersen. From the typical pentagonal profile of the physalis are developed rings, which customize themselves variabal to each hand. The unique and natural structure of the fruit mantle is transferred to each piece of jewellery during the production. That way rings, necklaces, earrings and brooches are developed.